Grace Hotels (www.gracehotels.com) today announces its first hotel opening in Latin America and Argentina’s newest luxury boutique hotel. 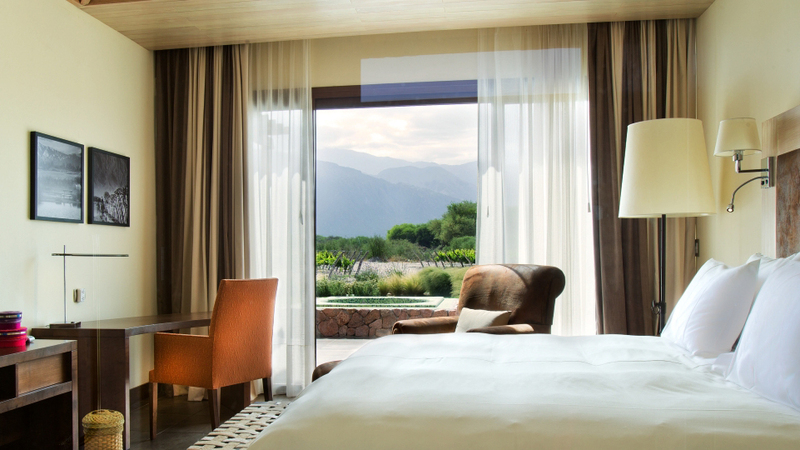 Located in the Salta province, Grace Cafayate is a breathtaking 32,000 m² property comprising a luxury hotel and spa and 20 residential villas, all set in the secluded 1,360-acre ‘La Estancia de Cafayate’ sporting and equestrian estate in the Calachaquí Valley. The 20 residential villas at Cafayate Grace are privately owned and let back to the hotel when owners are not in residence. A few villas remain unsold so there is still a chance for purchasers acquire a villa designed and built to Grace Hotels’ exacting standards. Representing a US$15m investment in the region, the development project was undertaken by Grace Hotels’ sister company, FSA Group (now incorporated in Elandis), which has offices in Argentina, Uruguay and Brazil. FSA has a strong track record of real estate investment and development throughout South America. With a portfolio in excess of 300,000 m², principal FSA developments include Forum Puerto Madero (premium appartments in Buenos Aires), Beccar Plaza (residential complex to the north of Greater Buenos Aires), and the Optima Business Park (high-specification office complex with over 60,000 m² of space). FSA Group and its parent company, the Libra Group have a long history of commercial activity in South America. FSA’s four main areas of focus are: real estate development, hotels and hospitality, real estate services and commercial financial advisory services. FSA Group’s complementary capabilities instil market confidence that all stages of a project life cycle can be handled with competence and expertise – from planning and conception through to completion and handover. As part of the Libra Group, which has real estate and hospitality interests on five continents, the hotel and hospitality division of FSA Group invests in, develops and manages prime hospitality opportunities throughout South America. With a strategic focus on identifying sites which display unique development potential, it can apply experience and insight to the creation of hotels in established or new locations. Earlier this year FSA Group announced a $270m landmark joint venture with Hyatt Hotels Corporation to develop and own nine Hyatt Place hotels throughout Brazil.